One of the most famous men associated with Machu Picchu was Hiram Bingham who was the official discoverer of Machu Picchu. Hiram Bingham was a professor from the America Yale college and led during his time in South America many expeditions into the Inca Heartland. In 1911 Hiram Bingham graced the boundaries of Machu Picchu in search for the coveted Lost City of the Inca's, where Hiram Bingham believed was the final place where the Incas retreated from the Spanish. 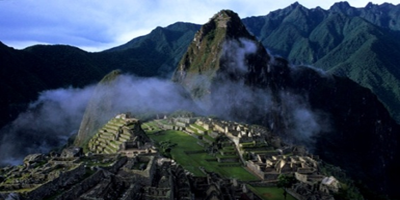 The tale of the Lost City was left behind by the Inca's who were captured by the Spanish conquistadors. This tale was full of stories of great treasures of gold and even became known as "El Dorado", The Golden where many went in search of. Vilcabamba in a site called Espiritu Pampa we can tell with some certainty was the last refuge of the Incas unlike Hiram's thoughts in regards to Machu Picchu. It is also quite ironic that Hiram Bingham actually discovered this site before he discovered Machu Picchu. With the help of a local historicist and a local farmer from Santa Teresa in 1911, Hiram Bingham led an expedition in which resulted the discovery of Machu Picchu. After freeing the site of overgrown jungle and with a little excavation, Hiram Bingham became convinced that he had finally discovered the "Lost City of the Inca's" built against the side of the great mountain. The world renowned National Geographic magazine, on hearing of this great discovery immediately published a large article and this discovery became world famous and one of the most important discoveries for over a century. One of the main points made was that Machu Picchu was actually the last retreat of the Incas but later Espiritu Pampa as mentioned above was replaced for its greater importance. Machu Picchu history was now born as now of of the 7 wonders of the world and still to day one of the most visited sites of South America. Many archaeologists have proceeded Hiram Bingham and made more and more important discoveries which have helped sculpt a picture of the history of Machu Picchu and how the Inca's lived during those days. So what exactly was the purpose that Machu Picchu was built? Well this has been the source of many debated topics over the years. These theories include a royal retreat for highly places and religious leaders. That it was an experimental area for agricultural testing and also that it was a trade centre on the crossing of many of the Inca pathways laid out over the Inca Heartland. Of course there is speculation it could have been simply a combination of all the above. One thing is sure that it definitly served a high purpose due to its location and the effort that was put into building this amazing place. Of all mentioned debates one thing that was agreed on by scholars was that it was abandoned around the time the Spaniards arrived in Cusco.Of the main reasons speculated for the abandonment of Machu Picchu was that the occurence of Spaniards on the Inca lands along with the introduction of new diseases such as Small Pox. On Hiram Bingham's discovery of the site many of the items found during excavations were held in boxes in Yale University for decades. After many long law suits 30 boxes of these items were returned to Peru! !